That said, it's also probably one of the most fiddly to sew. Before I released it, I had my doubts about the tiny pieces in the ear region and I got as far as redrawing the pattern to create a bunny with only one visible ear. It was easier to sew, but somehow it just didn't have the same charm. In the end, I decided that you were a clever bunch and could deal with the little pieces. I sewed my most recent version of the bunny this weekend and when I brought it through to show the family, it was immediately snaffled by my 5 year old boy. It would seem that my boy loves the colours. I can't blame him, these Cloud9 Cirrus Solids are beautifully vibrant and the fabric is amazingly soft. I am certain that this will not be the last time that I sew with them! The person who wins the Cirrus Solids scrap bag will be very lucky! 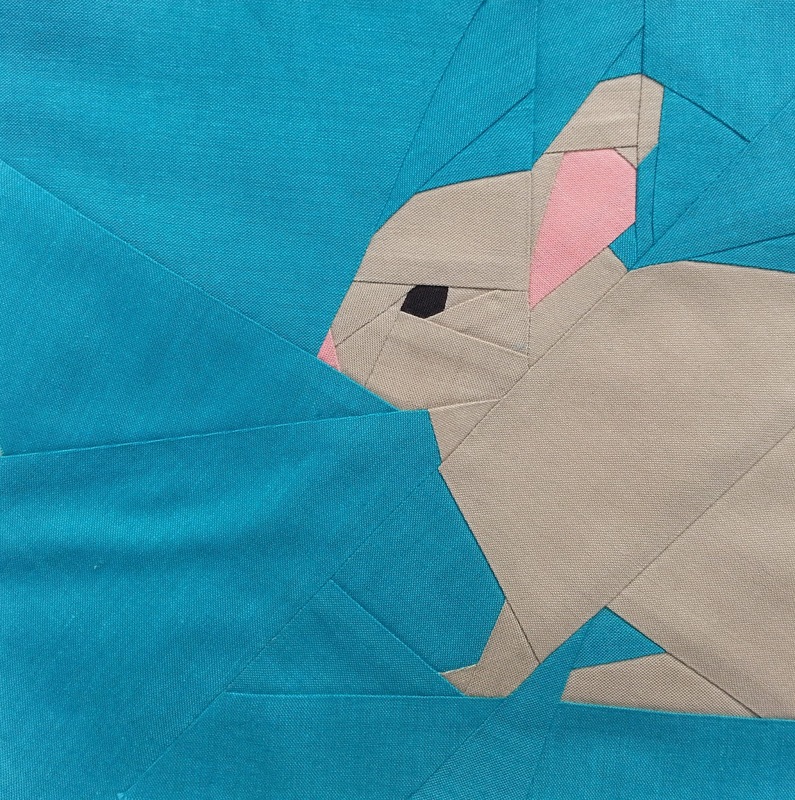 When you start a piecing a paper template with a small piece like an eye, the fabric is often only anchored to the paper by two or three tiny stitches. These stitches can easily rip away from the paper and it can be hard to piece accurately. I deal with this in several ways. Firstly DO NOT cut your fabric too small. I almost always use tiny scrappy offcuts for eyes but I do not accurately precut them. The piece of fabric might end up being one inch square instead of being a half inch square, so we are not talking about a huge amount of fabric wastage, just being practical and making life easier for ourselves. When positioning the first piece of fabric, pin it in place. Make sure that this pin is not on top of the first line of sewing and that you can sew the first seam without having to remove it. If possible, position the pin in a way that it can also stay in situ when you sew the second line too. Sew and trim your pieces as always, while leaving the pin in place. Don't be scared to sew past the end of the drawn line. One or two extra stitches can make all the difference. If the piece is directly next to the seam allowance, make sure that you sew into the seam allowance. Be especially careful when you are pressing the fabric away from the seam, try to be gentle, but to still fold as accurately as you can. Only remove the first pin after you have sewn the second seam (i.e. attached fabric piece number 3). By the time that this piece is attached, you should be past the danger zone and it the chance of the fabric tearing away from the paper is pretty small. I think I'm off to make another bunny rabbit. My girl needs a new pencilcase and this would make a very cute one don't you think!?! How are you getting on with your sewing for the #woodlandqa? You can find all the details about the Woodland Quiltalong here. 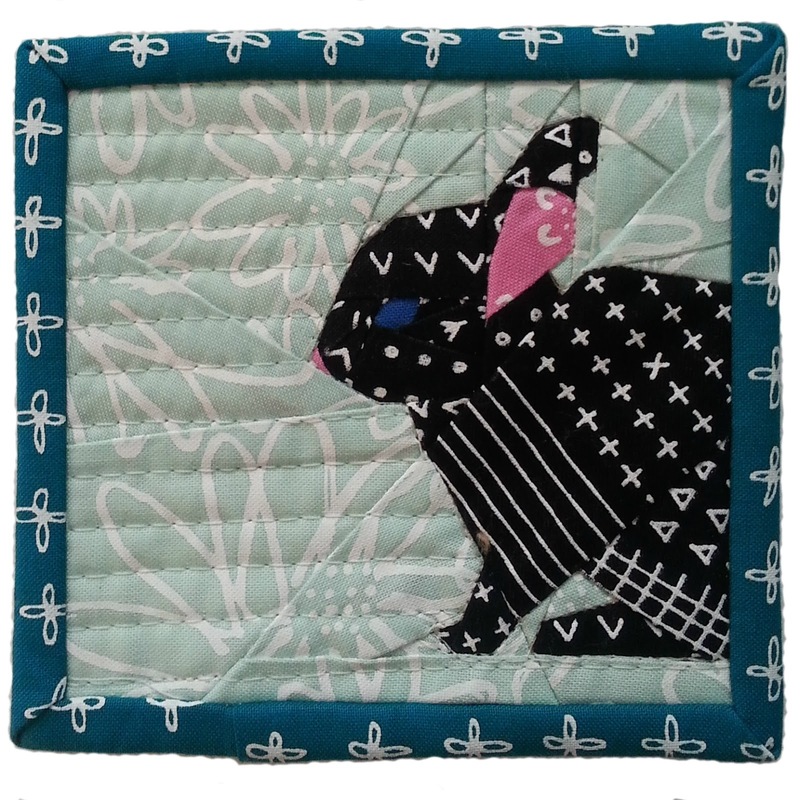 You can read about the Woodland Quilt-along prizes here. You can buy the woodland pattern bundle from my Etsy store, my Payhip store and my Craftsy Store. These patterns are just so cute and I am having the best time with them! Believe it or not--this will be my FIRST big quilt project (besides a small mug-rug I made.) I am enjoying the process and nervously anticipating the quilting part and the finishing part. Btw- have you created a colorful rooster pattern? I love the regal-ness of roosters and their colorful, proud plumage. Thanks:) ForMomCrochet on IG also.